We were in Cape Town over the Christmas holidays. 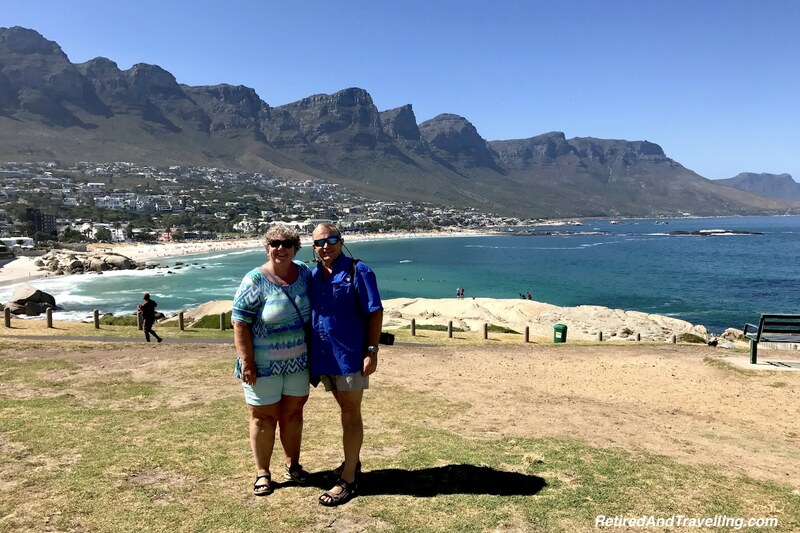 We had toured the old town, explored the wine country in the Stellenbosch area and travelled through the mountains for a game drive. Over the 51 days we were on our amazing cruise adventure, we had done so many bus tours. Once the cruise was over, I was not yet ready for another group tour. We got a stellar recommendation for a local guide named Gabe. He ensured that our day trip to tour the Cape in South Africa was a much more personal experience. We had an exciting agenda planned for our tour of the Cape. 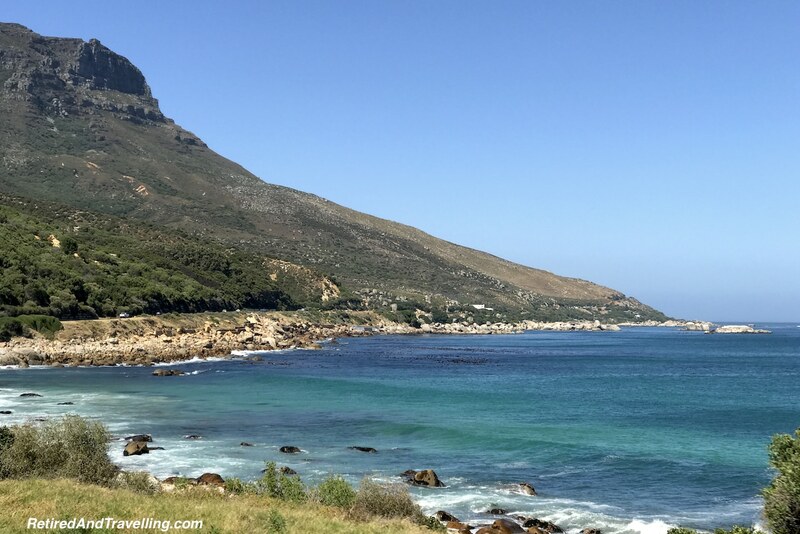 There was so much stunning beach and mountain scenery everywhere you travel in the Cape Town area. 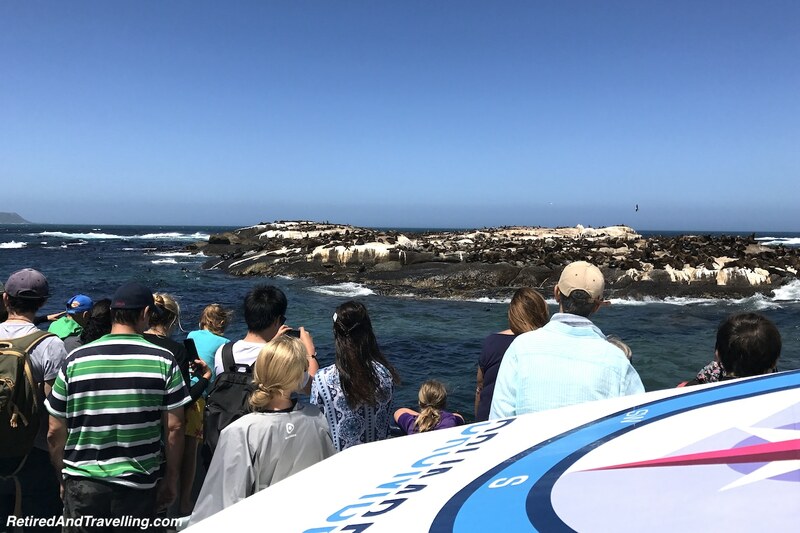 We had yet more animal experiences – seals, baboons and then penguins. 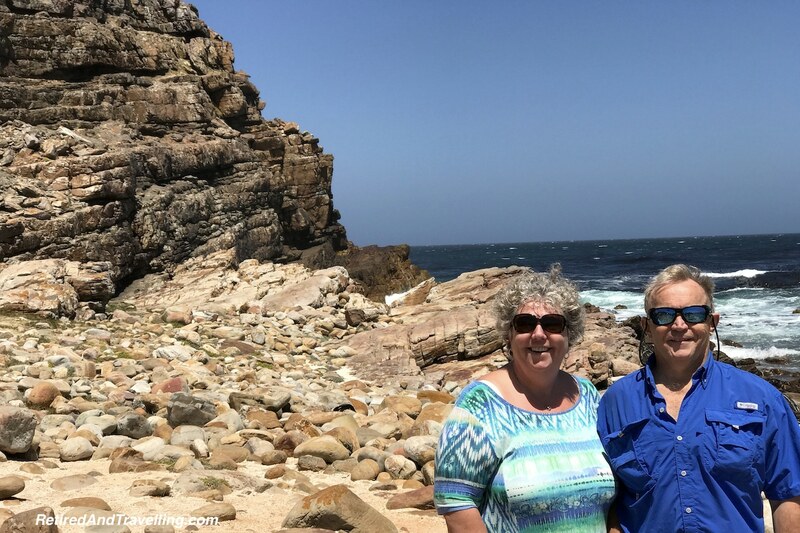 And we made it to the Cape of Good Hope! Gabe picked us up to tour the Cape in South Africa. 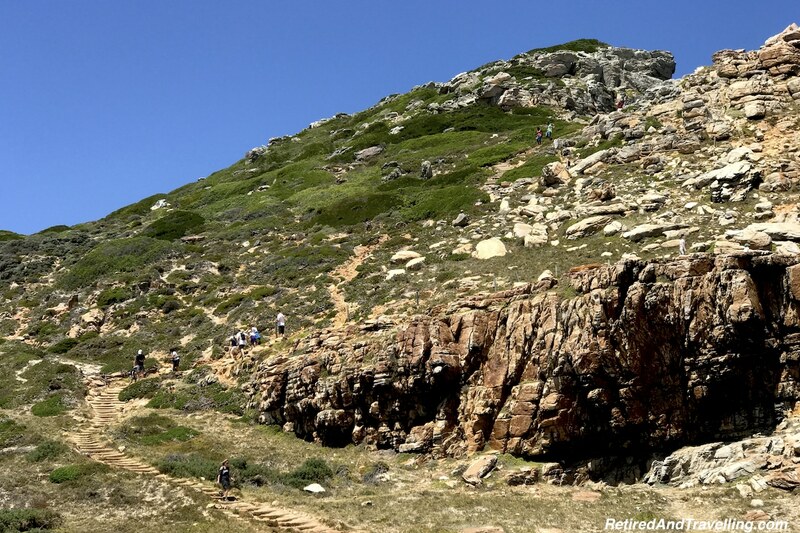 We headed first around Table Mountain to the beach areas of Cape Town. 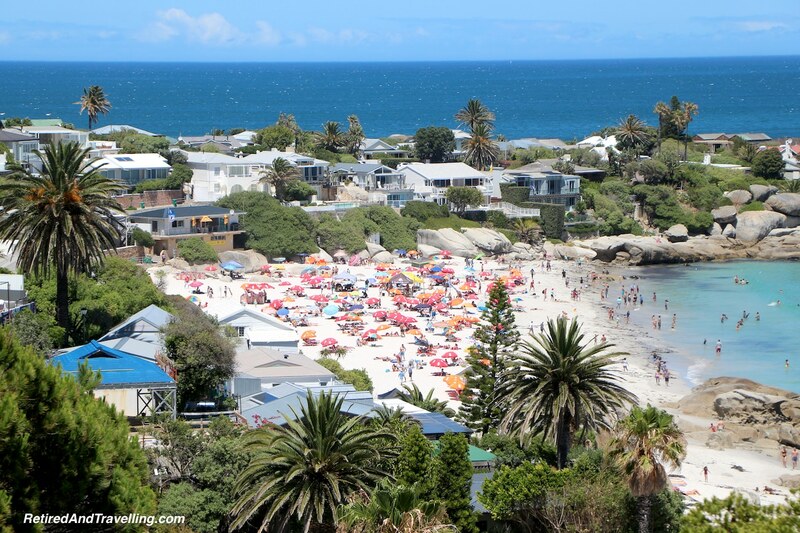 We had seen parts of this journey on our quick tour of Cape Town but from an enclosed bus. One of the advantages of travelling with a personal guide is the ability to stop when you want. This would not always prove possible on this trip. We had worried that things would be closed on Boxing Day but instead we found that everyone came out to explore the sites on this holiday. Crowded roads often meant passing by places we might have stopped. Our first stop was in Clifton to see the great sea and mountain views. The water was the greatest shade of blue. The surf pounded in. Beaches were lined with families enjoying the holiday. 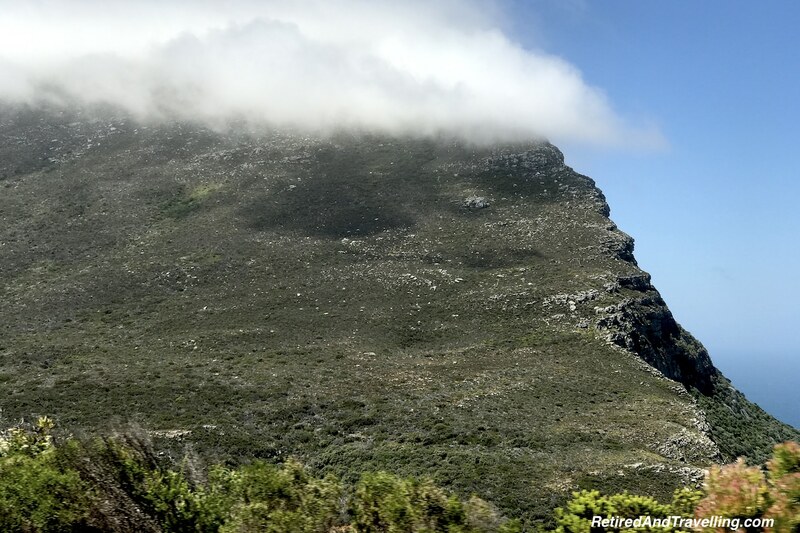 We could see the backside of the mountains looking out over Cape Town – Lions Head and Table Mountain. But from this vantage point we got a stunning view of the peaks of the 12 Apostles. Gabe told us not to bother counting as there are indeed 17 peaks! 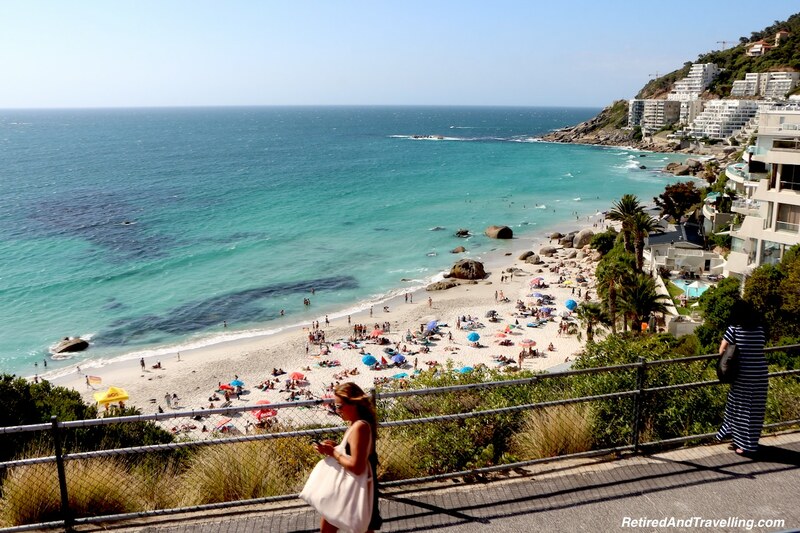 We continued along the coast passing Camps Bay on our way to Hout Bay. This sea views kept our heads turned out to sea. We entered the small seaside village of Hout Bay. 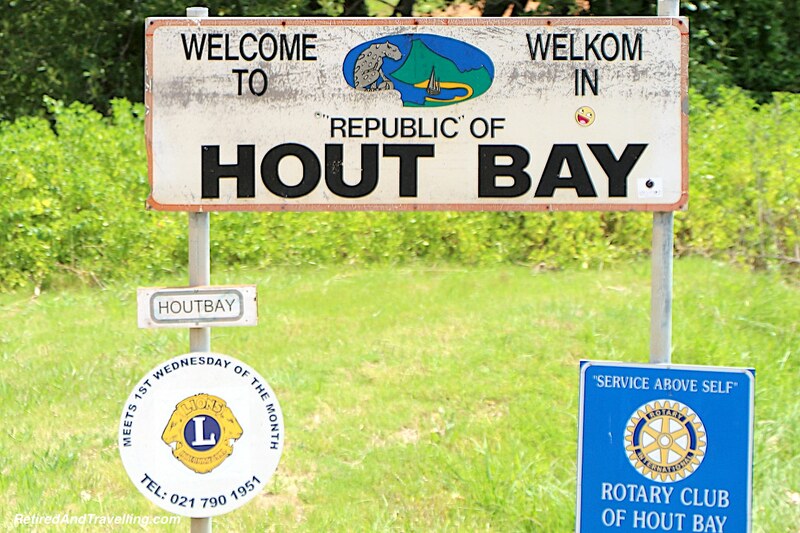 It was amusing to see that the locals referred to this little town as the “Republic of Hout Bay”. We fought for a space when we got into the parking lot. We were not the only ones visiting Hout Bay that day! Gabe walked us over to Drumbeat Charters and offered us the chance to take a boat to Seal Island before continuing our tour. The sun was shining, the water was relatively calm and the next boat was leaving in 10 minutes. 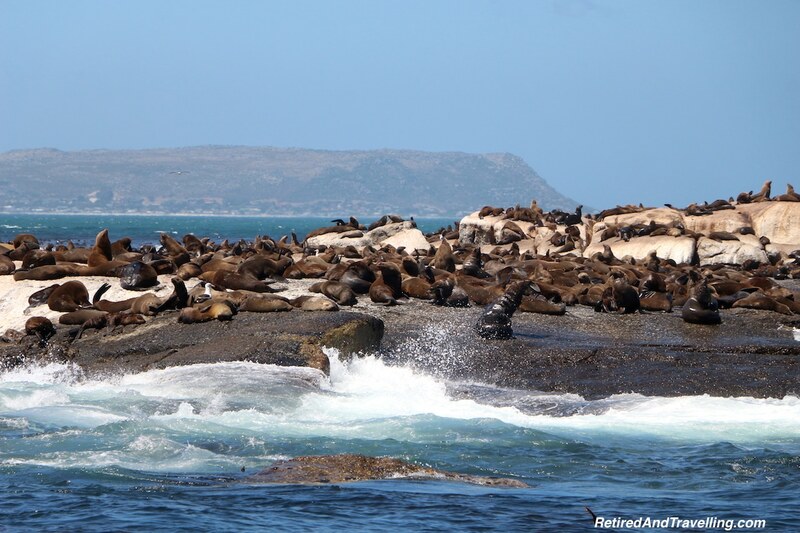 All of this convinced us to visit the Cape Fur Seals now rather than on another visit. 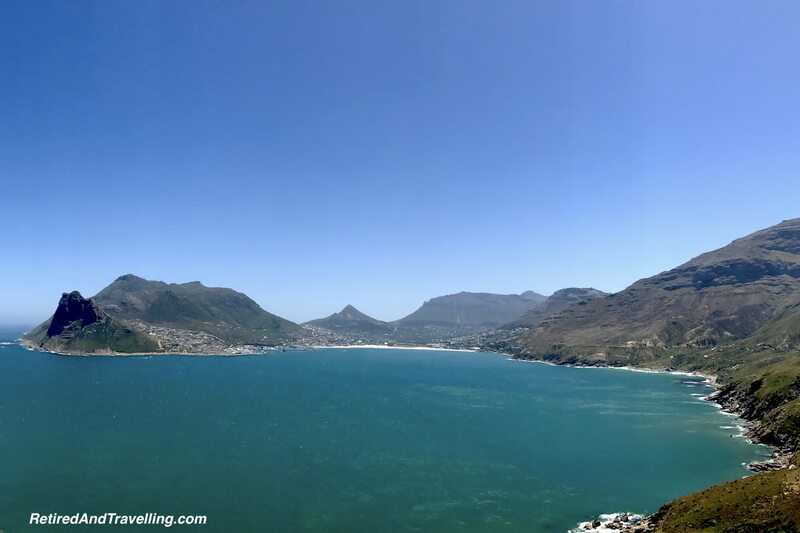 Hout Bay is on the Blue Route of the Hop-On-Hop-Off bus route if you are wondering how to visit without a private driver! Even before we got on the boat we were in for a show. A local character had drawn the attention of a seal in the harbour. He was feeding the seal to the delight of the crowd. Of course, a small donation was required for this entertainment and the pictures we took. We had been on many harbour cruises. We knew enough to take a seat in the covered section for the trip out to the island. The keeners that stood in the bow of the boat were drenched quickly, even in a relatively calm sea. We arrived dry. It is a very small seal island. The water is deep only on one side so the boat had to turn to give both sides of the boat a chance to see the seals. But there were lots to see! 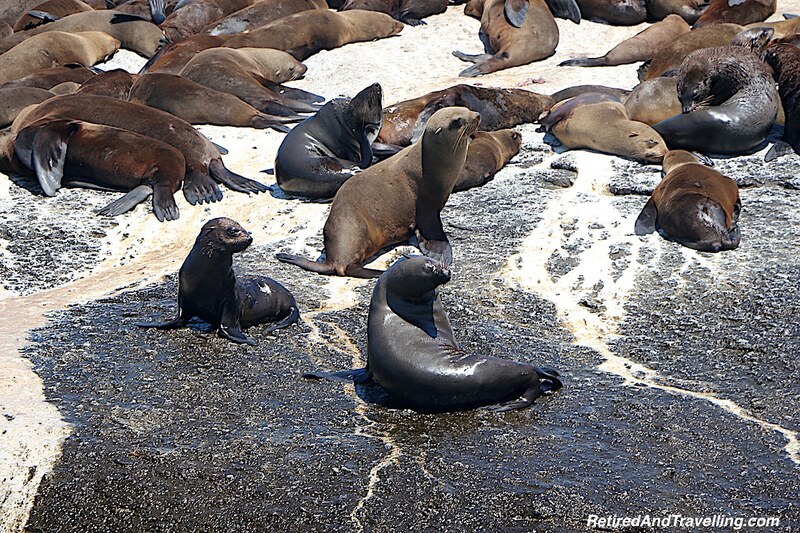 Hundreds of seals lounged on the rocks or frolicked in the water. They had no problem putting on a show for the people madly snapping pictures. 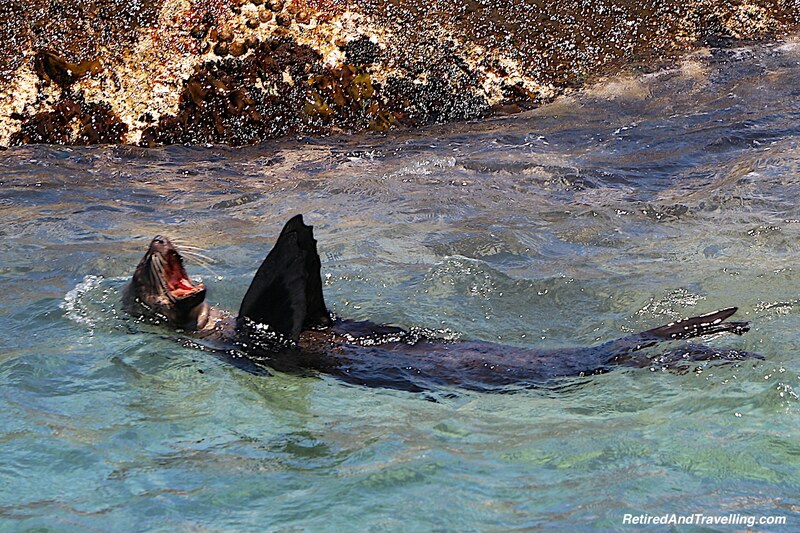 Adult seals can stay submerged for 30 minutes. The wait was sometimes long if you wanted the seals surfacing or lazing on their backs. The seals lounging on the rocks reminded us very much of the seals we had seen on the docks in San Francisco or the Elephant Seals along the coast by Carmel. It had been an interesting stop. We got back in the car to tour the Cape in South Africa. Leaving Hout Bay we headed for Chapman’s Peak Drive. 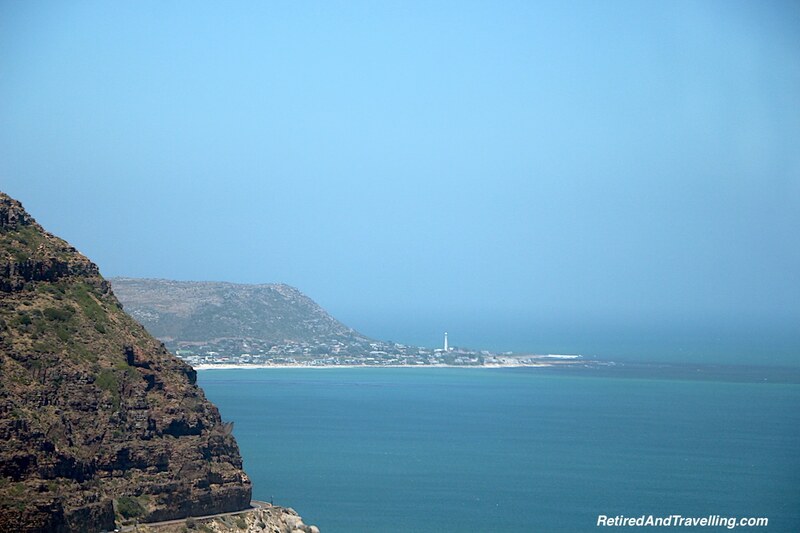 This is a toll road that provides a great cliff-hugging sea drive to tour the Cape in South Africa. Before the first turn we stopped to look back over Hout Bay. The road hugged the cliff. The sea pounded below us. At one point we travelled under a natural shelf that helps to keep falling rock off the road. This drive reminded us of travelling the Pacific Coast Highway (PCH) the U.S. or the fun of driving on the edge on the Amalfi Coast. As we came around we could see broad expanse of white sand beach. 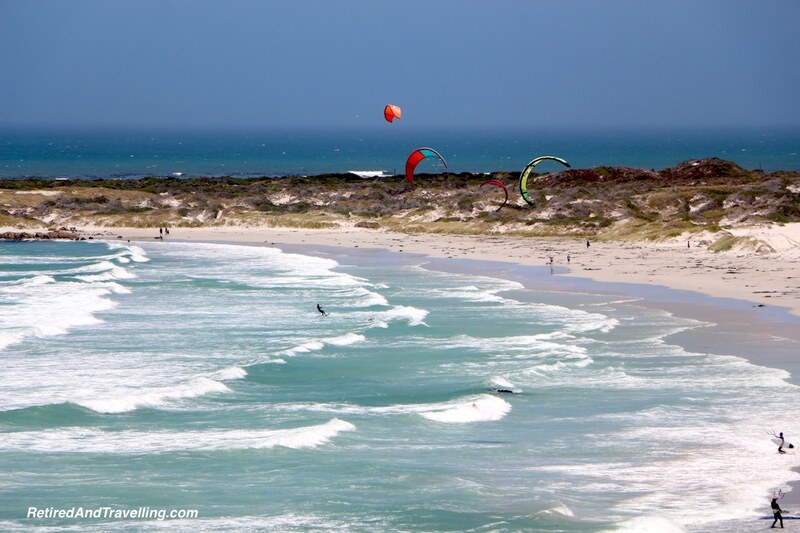 The waves were breaking on shore and the kite surfers where chasing waves. Far off in the distance we could see the point that is at the most south-western point in Africa when you tour the Cape in South Africa. 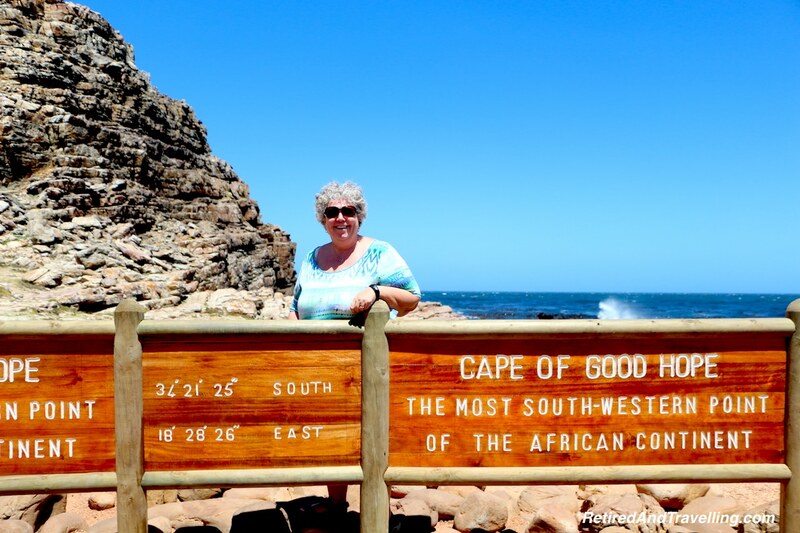 The Cape of Good Hope is the most south-western part in Africa. It is not really the most southern point in Africa nor is it the point between the Indian and Atlantic oceans (that is at Cape Agulhas). It is the point where two major ocean currents meet which produces a wide variety of marine life. But it is the point of land that most people think of when they think about sailing around Africa. We had passed this point on our cruise ship as it headed into Cape Town. 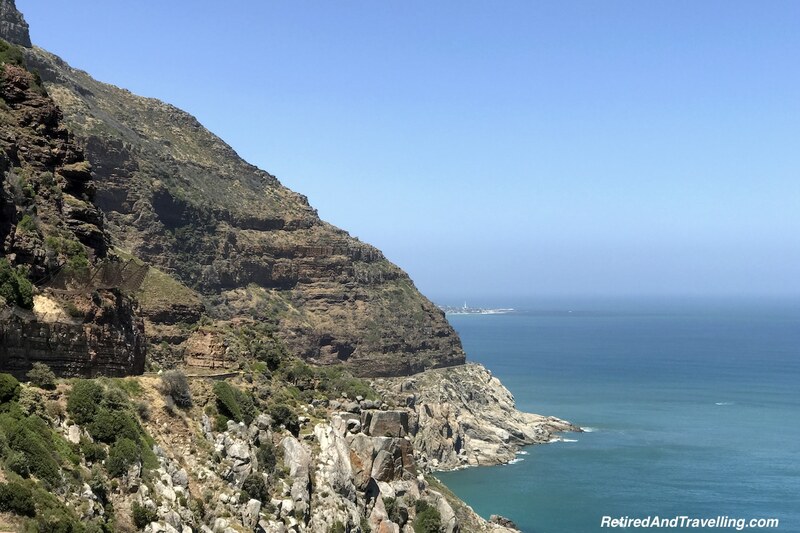 This tour of the Cape in South Africa would let us stand on the point and look out at sea. The Cape is located within what is now a national park within a fenced in area. As we came close to the gate, we immediately realized that we were not the only ones visiting the park. We lined up for about 45 minutes to pay and get through the gates. When we left the lines were even longer. The cars snaked for 2.7km to make the turn into the park. That did not even get them to the gate. 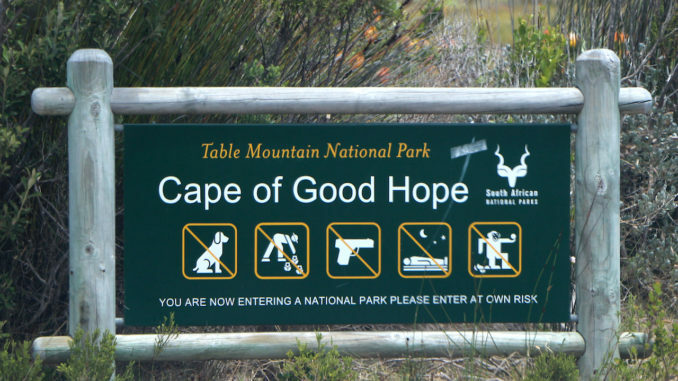 We headed first to the Cape of Good Hope. We paused for a picture before heading off to explore the point. 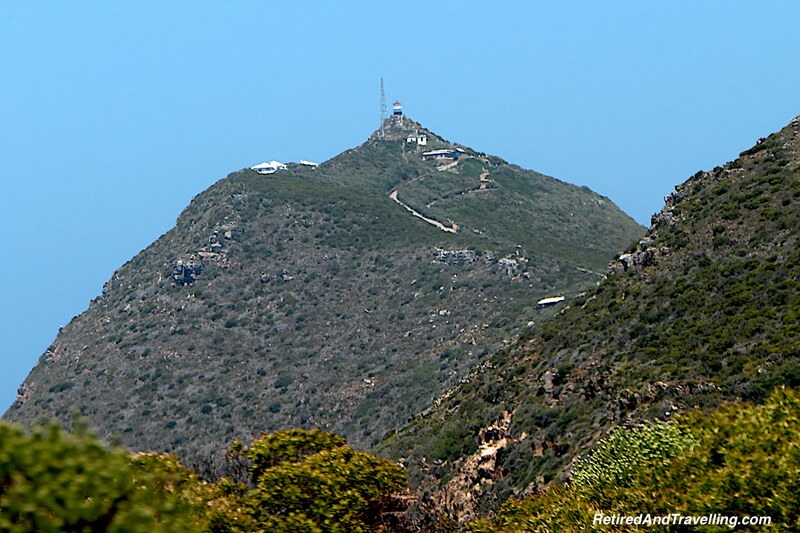 If you want to get a good view out to see you can take the walking path to the top. The crowded holiday roads had slowed us down. So we would pass on a walk to the top. The holiday crowds had also overrun the Cape Point Lighthouse parking area. We decided that we would not make the trek to the lighthouse. Something left for another visit when we might tour the Cape in South Africa. 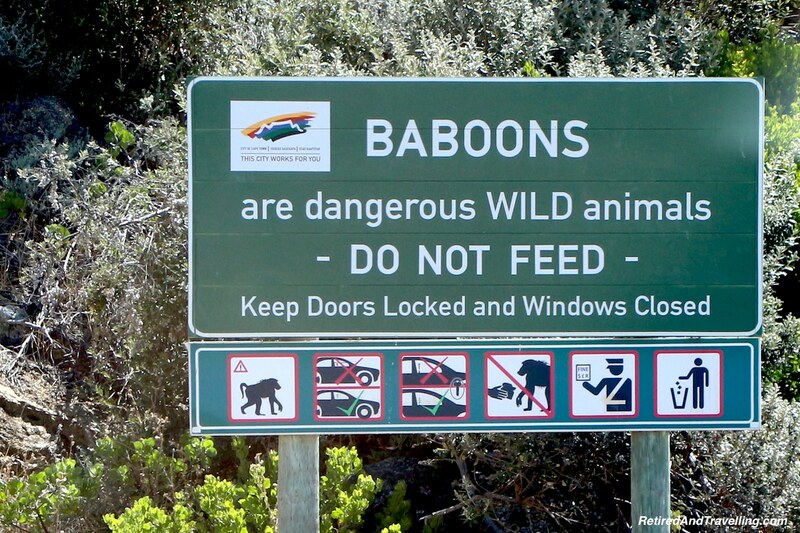 As we had travelled the roads along the water’s edge, there were numerous signs warning about baboons. But we had seen none. 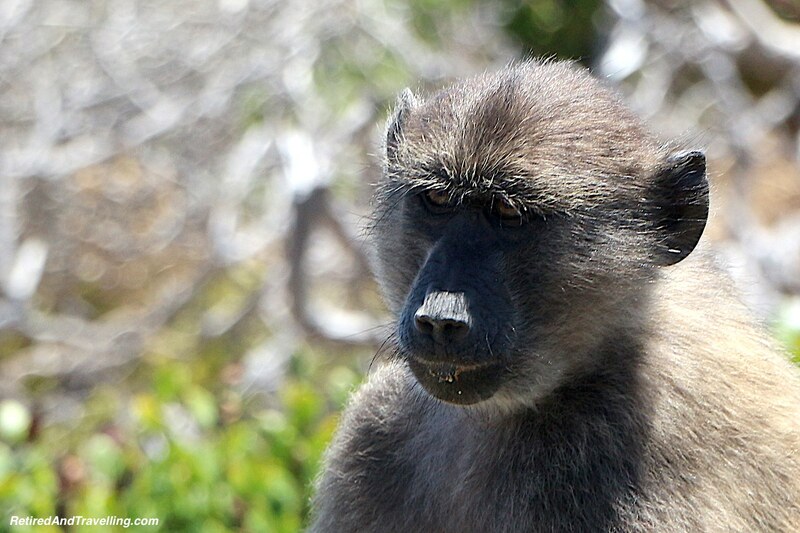 As soon as we got within the park’s gate, the baboons could be found everywhere. 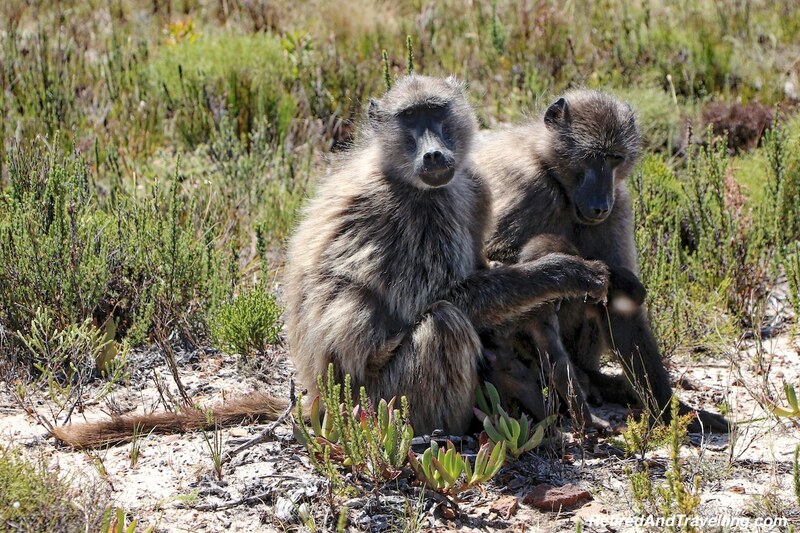 There are normally people shooing the baboons away but it appeared that they were on holidays. 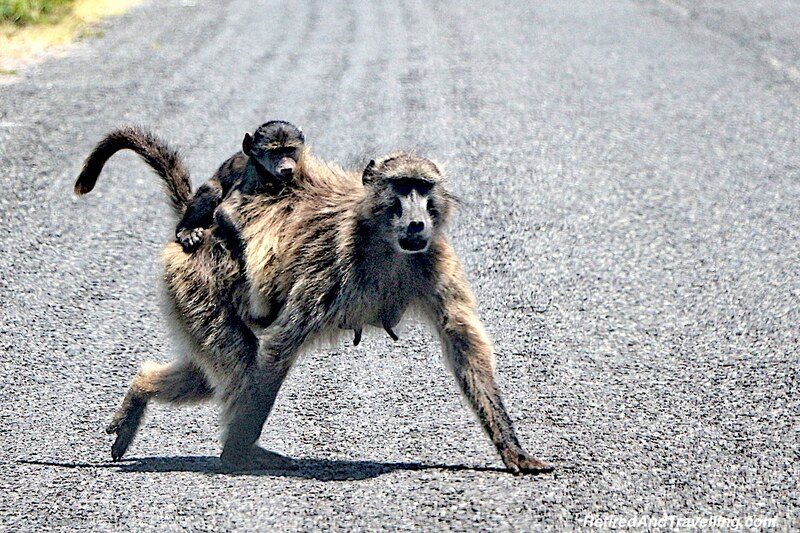 We saw baboons walking in the road, sitting in a group by the side of the road and even stealing lunch boxes. The park area is home to over 250 species of birds and various small animals. Gabe kept watching for one specific variety of Eland that he had seen recently in the park. We heard the birds but other than baboons saw no other wild life. On our drive that day we saw a great variety of native plants and trees. We would see much more of the local flora when we spent the day at the Kirstenbosch Gardens. Leaving the Cape we began our drive along the coast of False Bay. It was after 3pm and we had not yet stopped for lunch. Gabe had a spot picked out for us and managed to snag us a patio table. It was seafood for lunch! 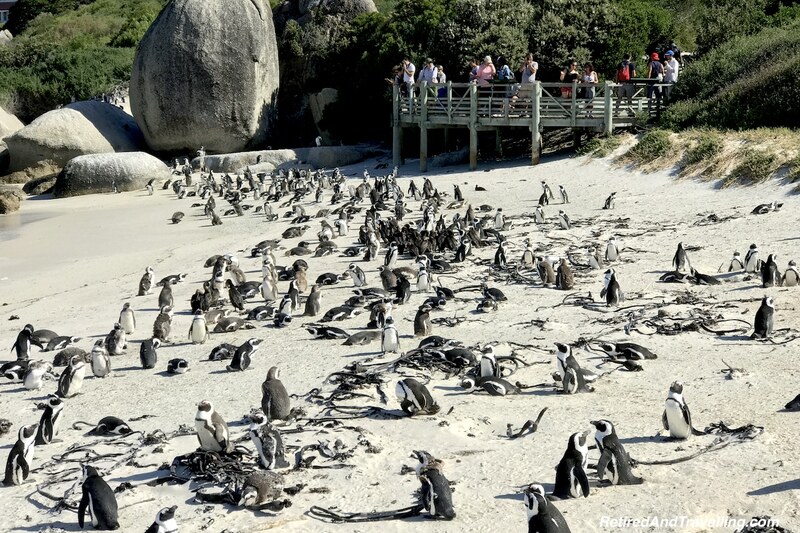 When we entered Simon’s Town the lineups to visit the penguins had been extremely long. Our lunch stop dissipated some of the crowd and Gabs was able to find a parking spot. 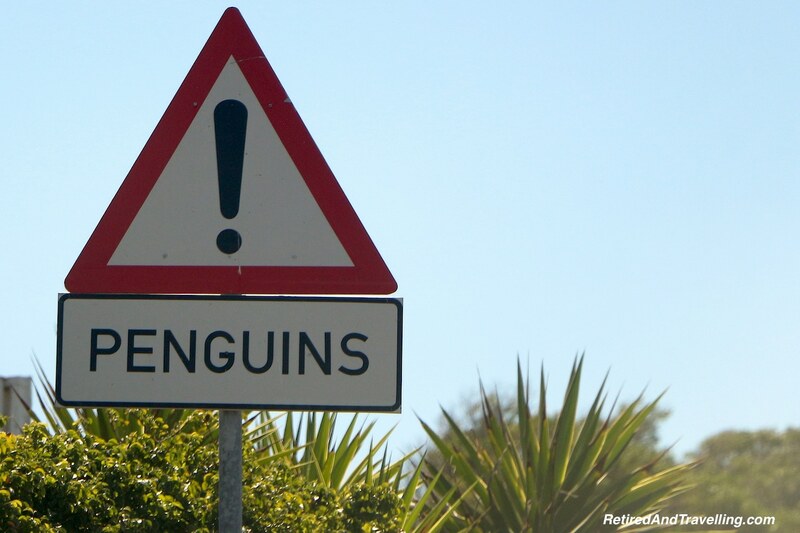 There was no street parking so we headed off for a short walk to Boulders to meet the penguins. A boardwalk took you out over the sand. We got excited when we saw our first penguin hiding in the rocks. We knew we were getting close when we heard he braying sounds that have earned them the nickname of “Jackass Penguins”. A short while later we saw our first cove filled with lazing penguins. At the end viewing deck, we could see penguins dressed in their tuxedos in every direction. 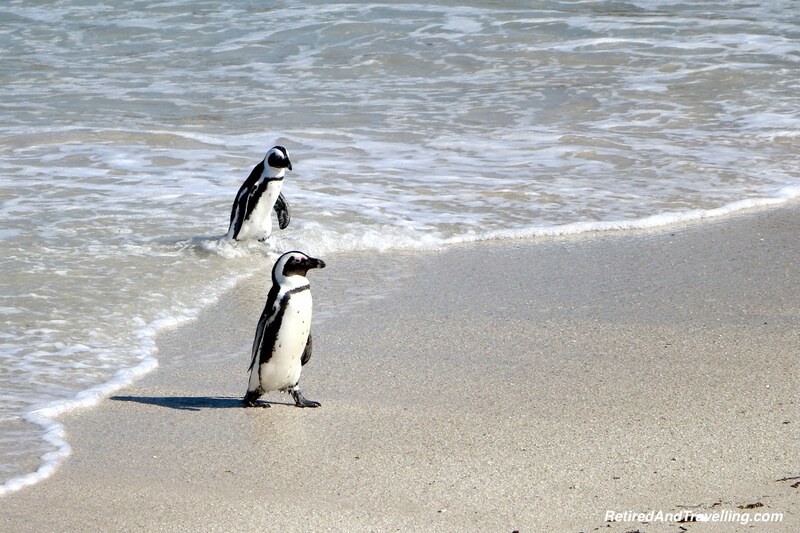 There are currently over 2,000 penguins at this one site but they remain on the endangered species list. 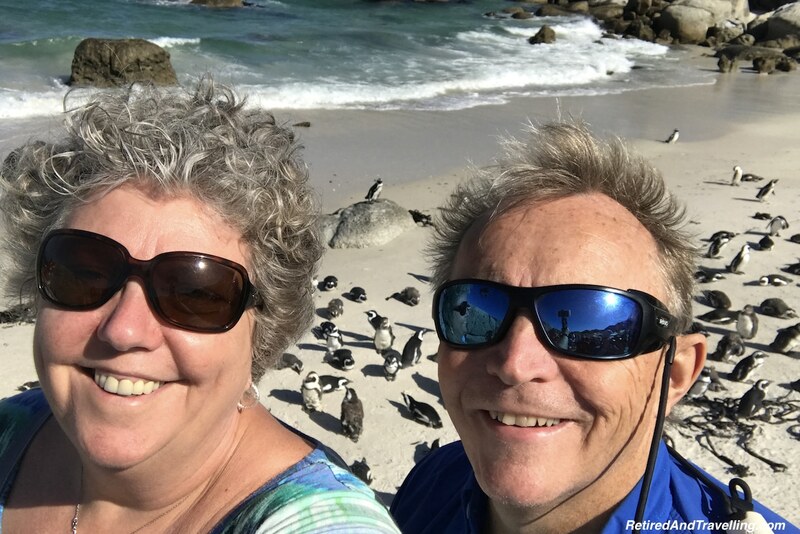 It was hard to imagine that these penguins all started with two breeding pairs in 1982! December is prime moulting season. 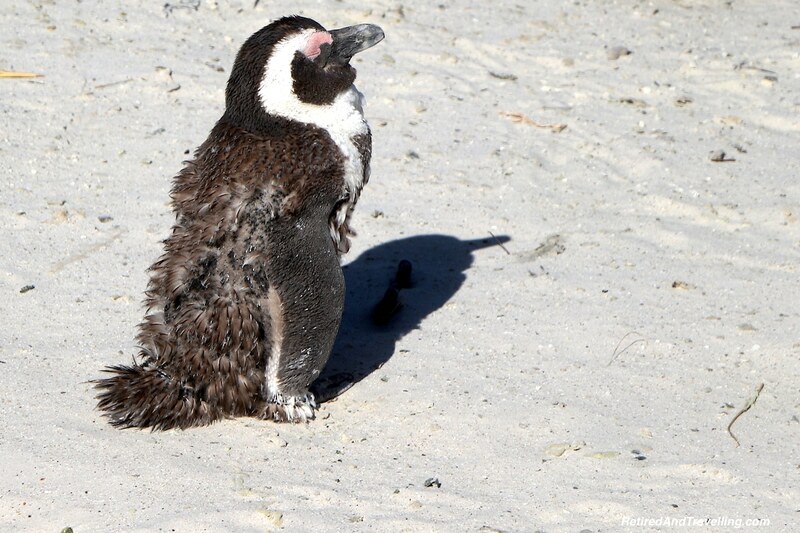 We found a large number of the penguins were in the middle of moulting (it takes about 13 days for an African Penguin). The penguins do not eat during moulting. They will head out to sea to feed when they finish moulting before heading back in to mate and nest. We stopped at every viewing angle to get our fill of the penguins before heading back to the car. As with the baboons, we respected the fact that these were wild animals. As cute as they were, we were not getting too close. 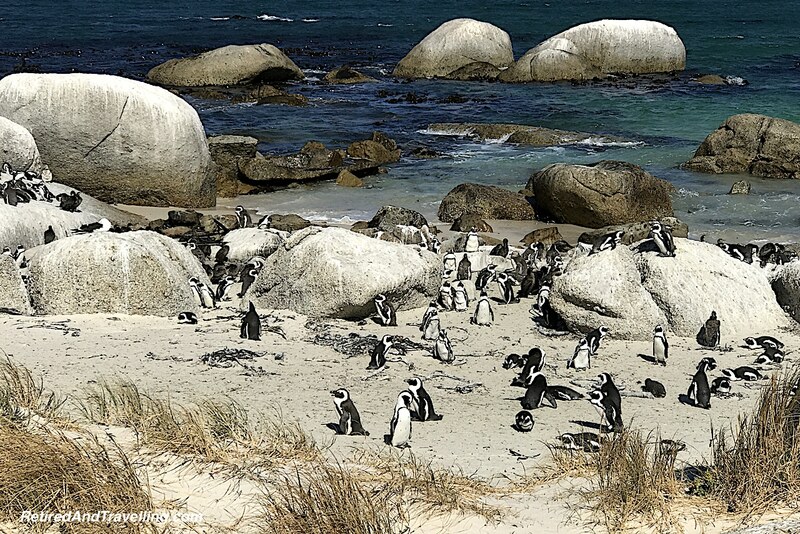 If you want to see even more penguins, you can also visit the colony on Stony Point. It had been an awesome day to tour the Cape in South Africa. I was wind and sand blasted and ready to return to town. 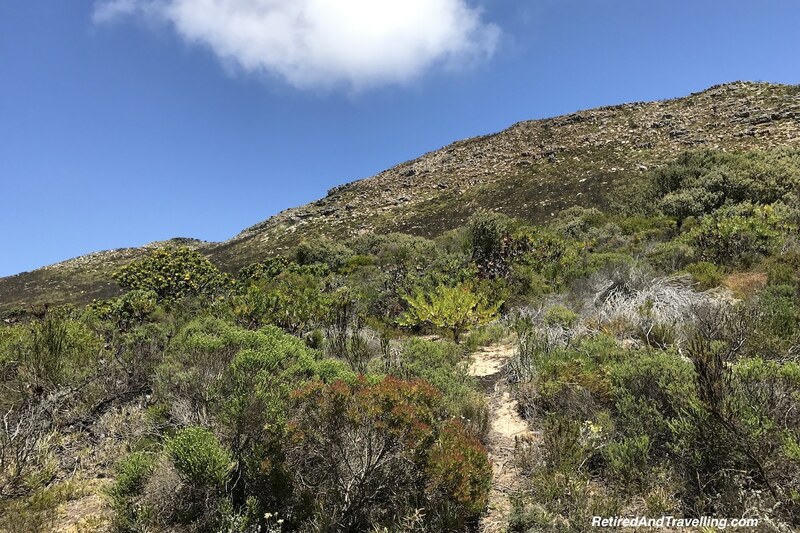 On another trip it would be great to drive along the mountain-side roads on the other side of False Bay towards Hermanus. There was still much to see as we wound our way back over the hills and past the seas surrounding Cape Town. 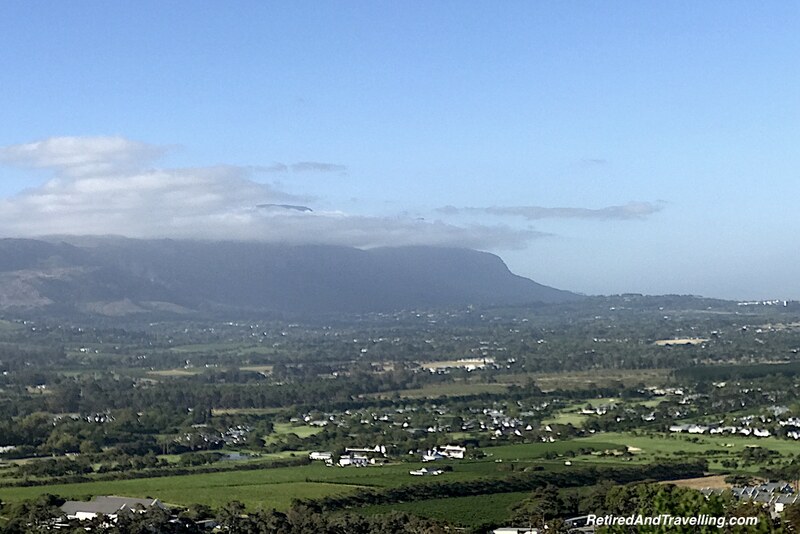 When we reached the wine valleys of the Constantia region, we could see the back of Table Top Mountain. 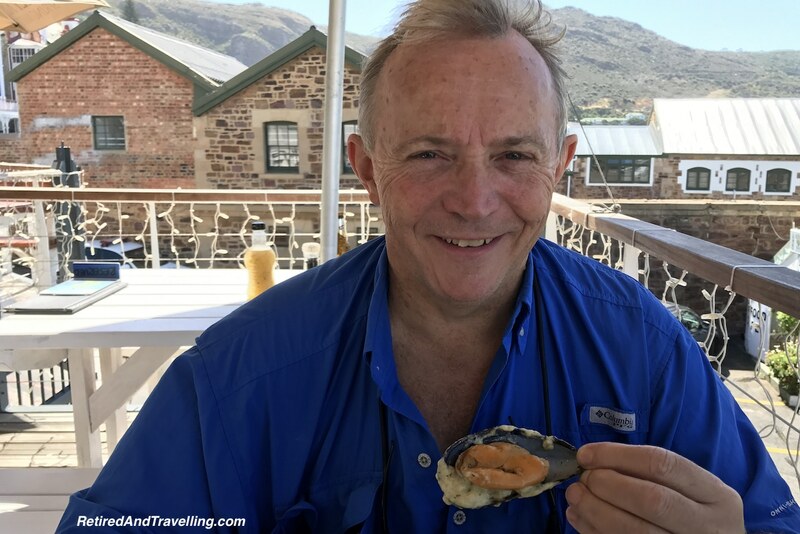 We visited the wine region of Stellenbosch but did not visit this wine area on this trip. 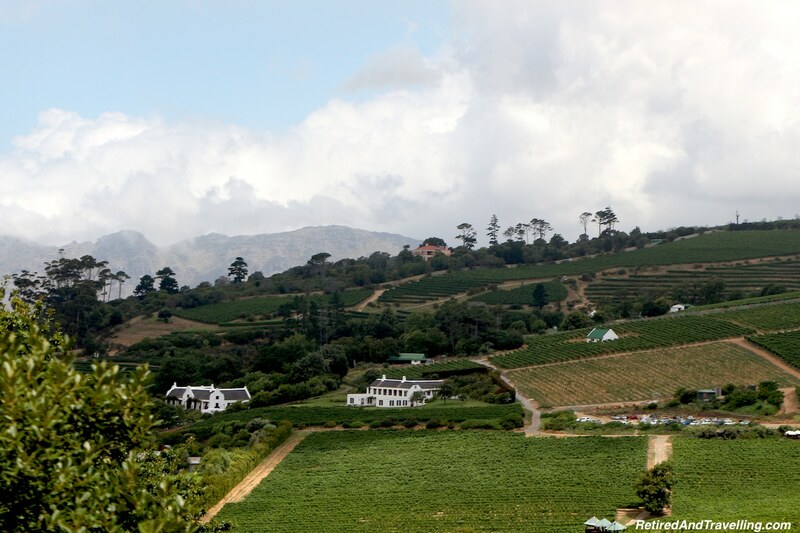 If you get a Hop-On-Hop-Off ticket, there is a tour of the Constantia wine region included. We knew we were almost back. We had a great day to tour the Cape in South Africa. It was Boxing Day and the crowds were much bigger than we expected. But even with the delays and the missed stops, it was a great trip around the Cape. 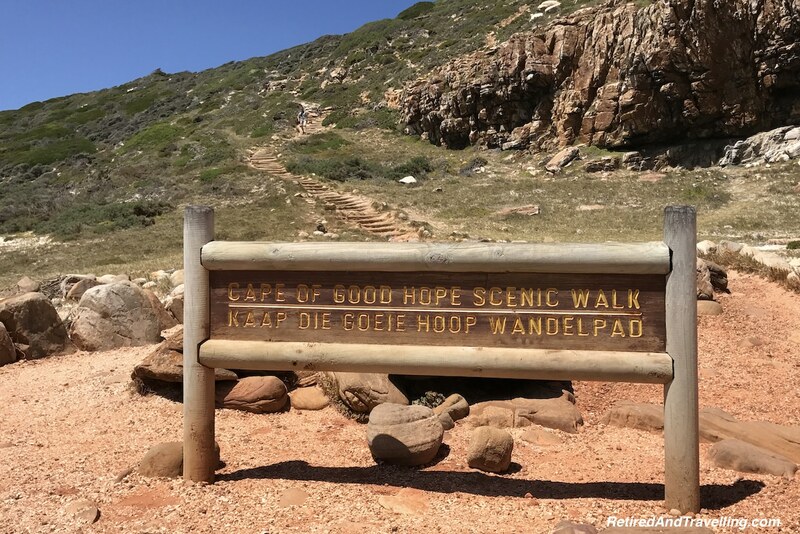 Make sure that you plan a day trip outside of Cape Town to do this trip. Plan to stop regularly to take in the amazing scenery. Leave early in the day and you can get out to hike in several spots. We were excited to see even more animals on this trip. 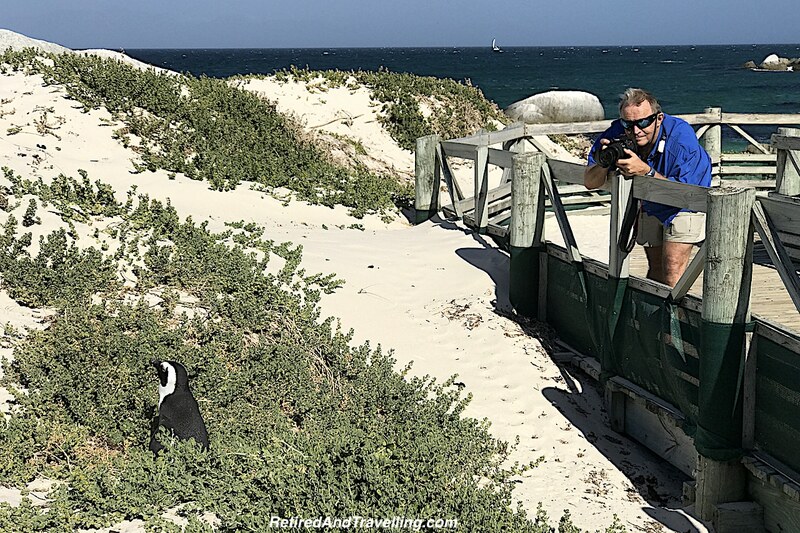 On our game drive outside of Cape Town we had seen large wild African animals but on this trip we added seal, baboons and penguins. 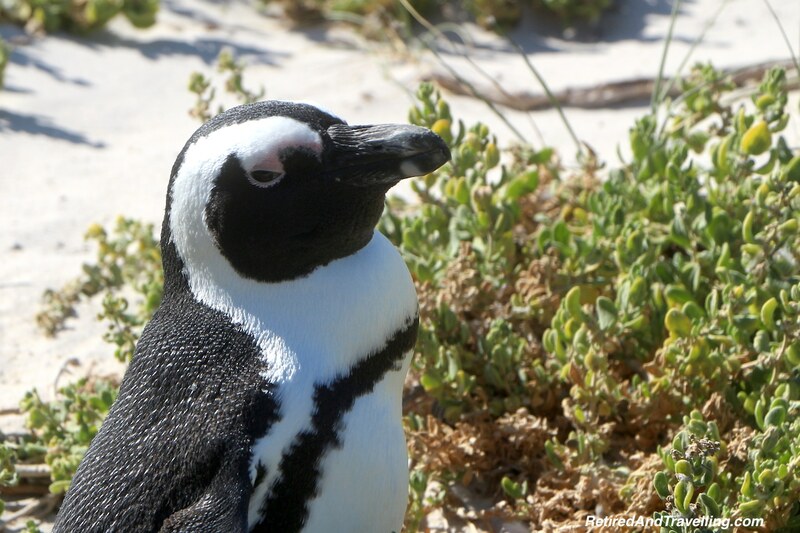 This variety of wild life is one of the reasons to visit Cape Town! 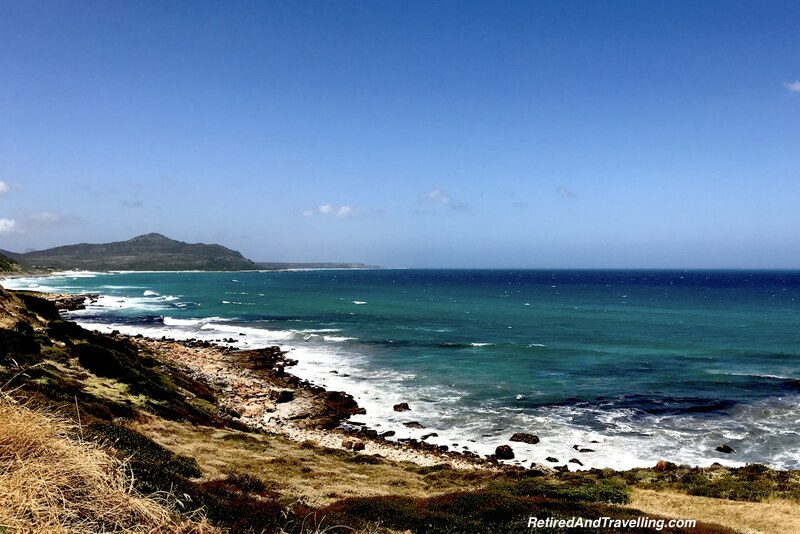 Have you had a chance to tour the Cape in South Africa? Did you find this drive reminded you of anywhere else? I am so glad you found Gabe to be as awesome as we have. You really crammed a lot into one day. Gabe is so knowledgable and really knows how to fit the most into a long day. 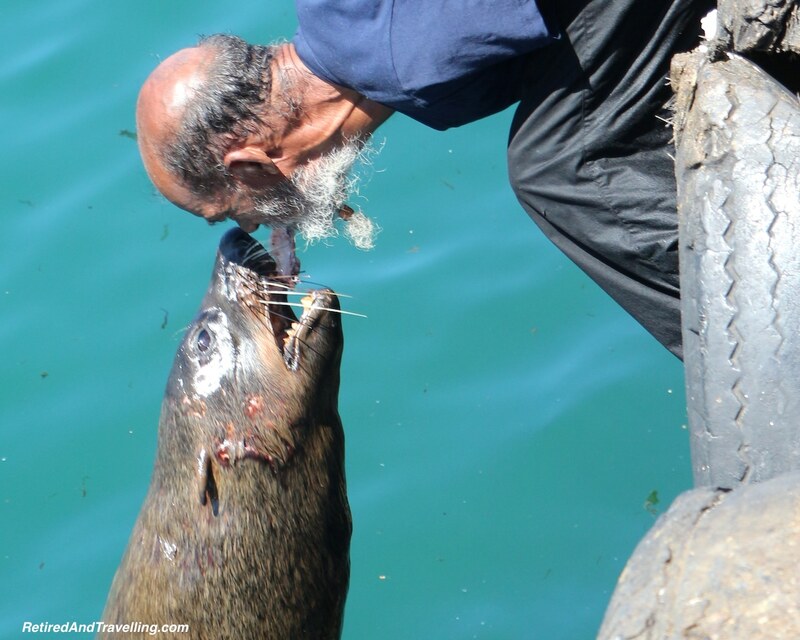 Your description of your day trip to Cape Point was so accurate and reflected our own trip a couple years ago, right down to the same man feeding the sea lions with a fish in his mouth. Your photos are always so well done. Anyone reading your blog can surly benefit from your detailed descriptions.